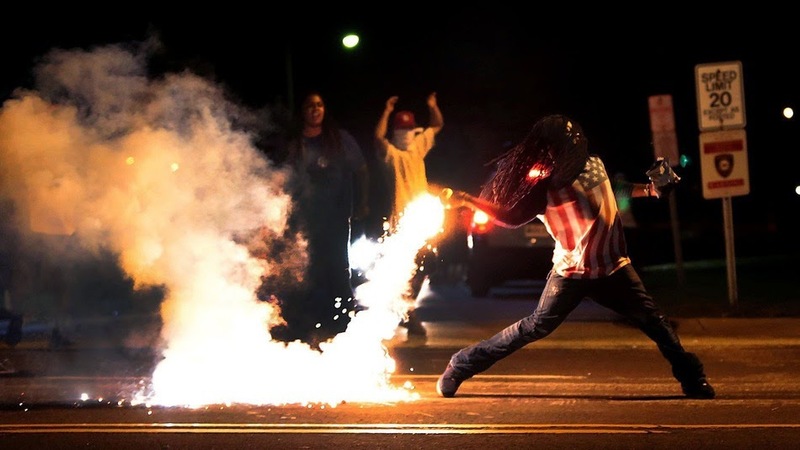 "The most iconic photo of the Ferguson Protests"
On August 9, 2014 Michael Brown of Ferguson Missouri was shot numerous times and killed by Ferguson Police Officer, Darren Wilson, followed by days and weeks of mostly peaceful protests with some rioting and looting and a militarized police response including Governor Jay Nixon's State of Emergency declaration and deployment of the Missouri National Guard on the streets of Ferguson. As a result, Ferguson residents were subject to martial law measures which included city-wide checkpoints, impeding travel and limiting access to friends, family and basic supplies needed for subsistence. Militarized police positioned snipers atop buildings and Mine-Resistant Ambush Protected (MRAP) vehicles pointing their military grade weapons at peaceful protesters and journalists. Residents and journalists were rounded up and caged in local jails and fired upon with tear gas and bullets causing serious injuries. To date, Darren Wilson remains on paid administrative leave as local, state, and federal investigations are underway. On Thursday, Attorney General Eric Holder announced a Civil Rights Investigation into the Ferguson Police Department. Meanwhile, the corporate owned media, with the exception of local news outlets have essentially disappeared from the scene in Ferguson while local residents and activists are organizing and taking action to stand up against police brutality, the militarization of police, racial profiling, and systemic corruption within local, state, and federal government agencies. On Friday, August 5, 2014, almost one month since Michael Brown was gunned down by Darren Wilson, Center Stage radio host, Kheri Hines has invited several protesters who have been on the ground in Ferguson since the beginning to join us on Center Stage for our sixth consecutive episode about Michael Brown's murder, to discuss recent events in Ferguson and future plans to address their concerns. We will also be joined by Zaki Baruti, a local leader of the Justice for Michael Brown Leadership Coalition who will provide important information about the coalition's 'demands' for justice for Michael Brown. We will speak with some of the protesters who have been on the front line of the "Justice for Michael Brown" movement since day one (including Edward Crawford, the young man captured in what many have referred to as "the most iconic photograph" of the protests). They will tell us why they have chosen to stay the course despite encountering militarized police presence and tactics that included being tear gassed, shot at with real and rubber bullets, having their movements restricted, constant checkpoints, facing attack dogs and being arrested. They will also explain why neither heat nor rain has hampered their need to seek justice for Michael Brown. Please join us for what is expected to be one of our most interesting and informative episodes thus far as local residents and activists tell us why they are willing to die for Justice. The call in number is (347) 850-8390.